Encouraged by family members, Jill Fanshawe Kato started drawing at an early age. Her interest in the natural world was awakened at the age of ten, when her family moved from Nottingham to the small Devonshire village of Kingskerswell, near Torquay. She cared for numerous injured or orphaned wild birds and animals and had a tame jackdaw which stayed for 3 years before returning to the wild. Thus started her lifelong love of nature which can be seen today in her ceramics.Travel to Spain, Asian countries, Brazil, to mountains and tropical islands such as the Maldives and Okinawa have all acted as sources of inspiration for Jill’s ceramics. She graduated in Painting from Chelsea School of Art, London, then gained an Art Teacher’s Certificate. After a period of teaching she had the opportunity to visit Tokyo in Japan. Even in the cheapest restaurants a long fish would be served on a long rectangular blue and white dish, with a variety of small dishes to complement the food. Sushi in shades of crimson, orange, yellow and silver appeared on a simple wooden board, beside it a yunomi cup of tea with fishing net painted on it. Expensive restaurants would use or display pottery by famous ceramic artists and handmade ceramics were a part of everyday life. 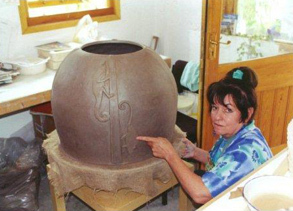 As a result of these experiences, Jill joined the school of potter Yosei Itaka and began to study Japanese pottery. This study was enhanced by visits to many of the traditional pottery towns and villages, some in production for over 1000 years. She tried Karatsu clay at Musoan Pottery School, near Tokyo, and experimented in the disused studio of a friend, with many kinds of clay and glazes fired in a gas kiln. Returning to London in 1977, Jill established her first studio with a grant from the Crafts council. Since then, she has lived and worked in north London with her husband, Japanese photo-journalist Setsuo Kato. She continues to exhibit in Japan, with 43 exhibitions there, mainly at Keio Department Store in Tokyo but also in Okinawa. She has exhibited widely internationally and across the UK.Jill was a lecturer on the Postgraduate Ceramics Diploma course at Goldsmiths College, London, for 17 years and tutor at Lambeth Institute and Kingsway College. She lectures widely on ceramics, demonstrates and teaches. She has worked at the studio of potter Ryoji Koie in Japan and was recently invited to two ceramic residencies in Spain. Interests include keeping an allotment with her husband, countryside walking, bird-watching, horse riding, going to exhibitions, sketching, travel. Jill is currently establishing a studio in Devon. Jill’s ceramics are inspired by the natural world and by travel. Making processes include coiling, slabbing, sculpting, using moulds and throwing and altering. Slips and glazes are applied for colour, which she constantly experiments with. She uses a range of stoneware clays and is currently experimenting with additions of River Dart clay, fired to 1270 degrees c. in a Laser gas kiln. Some raku pottery is also made. Work ranges from functional pottery for Western and Japanese use to large sculptural commissions and wall murals. ‘Over the past three decades Jill’s distinctive stoneware vessels decorated with images drawn from the natural world have been exhibited internationally, but most particularly in Japan and the UK. Fanshawe Kato frequently visits Japan to exhibit and study and her work is suffused with an intelligent understanding of the particular art of Japanese pots which she also in a modest way collects. The tactile, animated qualities- the ‘atatakai’ as the Japanese expression has it- are clearly evident in her work. Yet there is also in the stylised bird, fish and plant forms and indeed the bold, gestural abstract blocks of colours, a quintessentially English quality, a kind of gentle humour that one sees in the works of painters such as Mary Newcombe or the illustrations of Eric Ravilious.